We had just wrapped up our 2nd evening at Sattal and were in a busy discussion when we got into our car to head back to the hotel. As soon as we started back on our way the driver stopped. 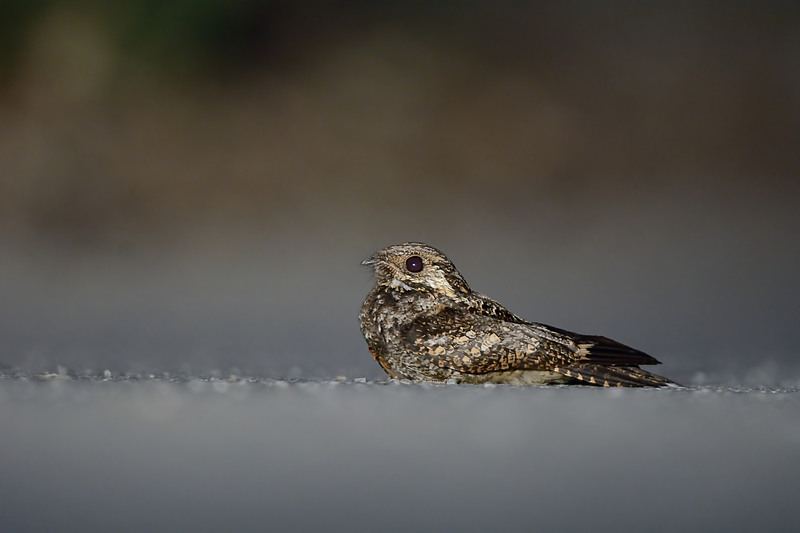 There on the road, lit by the headlights of the car was a Nightjar. 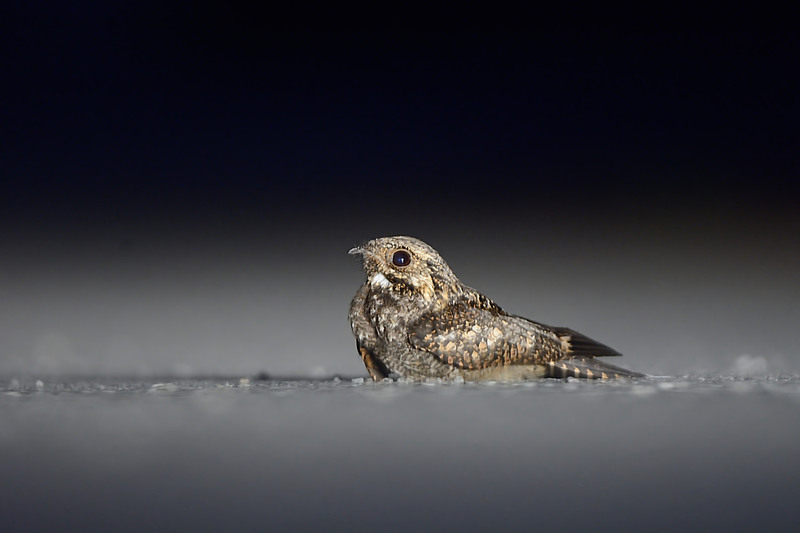 Apparently, Nightjars freeze when there is a light source on them. So the driver kept the engine running and the headlights on while we quickly got down with our cameras. Thankfully, I had not packed my gear up after the session and was the first one on the ground. The first thing I did was to bump up the ISO to 1600 – the limit that I was comfortable with on the D7100. The next was to set exposure compensation to -1/3 to try and bump up whatever little speed I would get from the shutter. And then I lay flat on the road and get a couple of record pics. I noticed that the shutter-speed was at 1/10th – extremely low and probably the first time in my experience that I was at these speeds. I decided to bump up the ISO to 2500 and started creeping towards the bird. I had never taken pictures in this situation before – in pitch darkness with the subject lit up by the yellow light of the headlight and I was a bit lost about what to do about the white balance. A quick question to Rahul and the answer was obvious in hindsight – set white balance to tungsten (or any low temperature setting) to ensure that the warmth of the yellow light gets negated. Once I made the adjustment to the setting I continued to crawl on the road toward the bird and when I felt that I had reached the optimal distance for the right composition, I stopped. The camera was on the road and that stability was crucial to get as sharp an image I could get in this low-light condition. I have seen a few species of nightjars before and have always found it difficult to identify them. This one looked a bit different and that made it even more difficult. The others in the group were a bit uncertain as well – so we decided to focus on taking pictures and leave the identification to later. From the position I was shooting from initially, I was getting the forest in the background which seemed to be reflecting the light from the headlights. Since I wanted the background to be dark I shifted my position so that I would get only the bird and the road in my frame. This obviously meant that I had even lower light in the frame – so I pushed up the ISO even further to 3200. The results were much more to my liking now. You be the judge.